They members (excluding the Chairman) are appointed for four years and take up post in October 2012. The legislation allows for a Board of between eleven and fifteen members. There is an expected time commitment of 10-15 days per month up to April 1, 2013, after which it will be no more than 10 days per month for the first full year. The remuneration rate is a daily fee of £280. DACO Response and Resilience ? There are 357 stations in Scotland, 65 in the East SDA, 165 in the North SDA and 127 in the West SDA. Made up of 50 Wholetime, 24 Wholetime/Retained, 240 Retained Stations, 34 Volunteer and 9 Community Response Units. The East SDA has 15 Wholetime, 8 Wholetime/Retained and 42 Retained. The North SDA has 7 Wholetime, 5 Wholetime/Retained, 140 Retained Stations, 4 Volunteer and 9 Community Response Units. The West SDA has 28 Wholetime, 11 Wholetime/Retained, 58 Retained Stations and 30 Volunteer Units. A Rescue Pump Ladder in the new livery. 27/3/2019 It was announced today that Area Manager Ross Haggart and Area Manager John Dickie have been appointed to the post of Assistant Chief Officer Prevention and Protection and Response and Resilience respectively. ACO Lewis Ramsay until his retirement will undertake a process of Gold Command development for the DACOs within the Service. The two new ACOs will take up their posts on 1/4/2019. 16/2/2019 Today Martin Blunden became the second Chief Officer of the Scottish Fire and Rescue Service. 15/2/2019 Chief Officer Alasdair Hay QFSM CBE retired today after 36 years as a Firefighter which included 6 years as the first Chief Officer of the Scottish Fire and Rescue Service. 28/1/2019 R1/19 a 14 week course started today at the National Training School, Cambuslang with 60 Wholetime Firefighter Trainees. A separate course also started for 14 Operational Control Trainees. 24/1/2019 Assistant Chief Officer David McGown (Director of Prevention and Protection) has been appointed to the post of Temporary Deputy Chief Officer (Director of Service Delivery). 21/1/2019 Today Chief Officer Hay welcomed his successor, Martin Blunden, to the Scottish Fire and Rescue Service. Over the next four weeks, he will be introducing Martin Blunden to the key elements of the Chief Officer’s role, before he officially takes it up on 16 February 2019. Chief Officer Hay will retire from the Service on 15 February. 11/1/2019 Temporary Deputy Chief Officer (Director of Service Delivery) post advertised. This is a long term temporary post with a maximum time of two years. 21/12/2018 Deputy Chief Officer Iain Bushell has resigned from his post as Deputy Chief Officer to pursue other opportunities. 7/1/2019 18 newly appointed RDS Support Managers started their new roles today with a course and to discuss the concept of the Rural Full Time Posts at SFRS HQ Cambuslang. 29/12/2018 Group Manager Brenda Gillen, OiC of Johnstone Operations Control and Dundee Community Firefighter Kevin Phillip both received the Queen's Fire Service Medal in the New Year's Honours List. 14/12/2018 23 recruits passed out today at their Graduation Ceremony at Thornton Training Centre. They will be posted to stations in Stirling, Clackmannanshire and Fife in the new year. This is the last recruits course to be held at the Thornton Training Centre which has been in use as a Training Centre since the 1970s. Future Training Courses in the East SDA will be held at the new Training Hub at Newbridge in Edinburgh, which is due for completion in March 2019. 13/12/2018 23 recruits passed out today at their Graduation Ceremony at Portlethen Training Centre. Course T3 2018. They will be posted to stations in the North SDA. 7/12/2018 The Scottish Fire and Rescue Service's Director of Response and Resilience, Lewis Ramsay, has been awarded Outstanding Contribution to UK Fire and Rescue Services at the Excellence in Fire and Emergency Awards 2018 in London. 27/11/2018 Martin Blunden at present Deputy Chief Officer of South Yorkshire Fire and Rescue has been appointed as the new Chief Officer of SFRS and will take up the post in early 2019. 24/9/2018 At 4 pm today ST18OYO, the first Rapid Response Unit to go on the run in Scotland, went on the run at Valtos on the Isle of Lewis. 3/8/2018 103 recruits have now Passed Out from three Training Schools, Course T2/18, after 14 weeks of intensive training and will be posted to stations, 58 at Cambuslang on 27/7/2018, 24 at Portlethen 2/8/2018 and 21 at Thornton today. 1/8/2018 Six new members will join the SFRS Board in October, they are Brian Baverstock, Lesley Bloomer, Malcolm Payton, Mhairi Wylie, Nicholas Barr MBE and Tim Wright. 12/6/2018 Official launch of 20th Water Rescue Unit in Aberdeen Central Station. This Unit will be capable of conducting rescues in shallow, deep, fast moving and standing bodies of water. 8/6/2018 In the Queen's Birthday Honours list ex Chief Officer of Highlands and Islands Fire and Rescue Service and now Chief Officer of Gloucestershire Fire and Rescue Service was awarded the Order of the British Empire (OBE) for his 27 years service to Local Government. Retired Deputy Assistant Chief Officer Ally Boyle has been appointed a Member of the British Empire (MBE) for services to charity, particularly the Scottish Fire and Rescue Service and the Anthony Nolan Partnership. The Queen's Fire Service Medal was awarded to retired Area Manager David Rout (LSO for Aberdeenshire and Moray), Operations Control Area Manager Libby Logan and Retained Watch Manager Rosemery Curtis Kilchoan Unit. 7/6/2018 A £1.3 million investment in new specialised kit for severe weather responses from which over 7,00 firefighters will benefit was announced today. The heavy-duty, PVC kits have already been introduced to 13 stations in each of the West, East and North Service Delivery Areas – including Banchory, Inverurie, Oldmeldrum, Altens, Braemar, Fochabers, Dreghorn, New Cumnock, Newton Stewart, Lockerbie, Peebles, Jedburgh and Eyemouth – and will soon be rolled out across the country. 23/5/2018 The roll out of the new BA sets is now complete. A total of 2,200 sets by Draeger each with a working duration of approximately 38 minutes are on the run at every station or unit in Scotland. The cost of the change over from the various sets in the legacy services was $4.5 million. 18/5/2018 The roll out of the new Bristol fire kit consisting of tunics and leggings has commenced in the North and East SDAs with the West SDA roll out due to commence soon. New Fire Helmets (Rosenbauer), gloves and boots will only be issued when the present ones are unserviceable. 15/5/2018 Chief Officer Alasdair Hay has announced he will be retiring in March 2019. 25/4/2018 Launch of the new Rapid Response Units at Portlethen Training Centre, each one will carry a crew of four, two BA sets and Cobra Cold Cutting Equipment which can cut through steel or brick enabling Firefighters to tackle a blaze more safely from the outside. This is a £7.6 million investment. 13/4/2018 53 new Firefighters passed out today at the Scottish Fire and Rescue Service’s National Training Centre in Cambuslang. 8/3/2018 A turf cutting ceremony led by Community Safety and Legal Affairs Minister, Annabelle Ewing, marked the first phase of construction at the SFRS East SDA Headquarters in the city’s Newbridge area. The £12 million Training Centre will open in March 2019. 26/1/2018 Area Manager David Proctor, LSO for East Renfrewshie, Renfrewshire and Inverclyde retired today after 30 years service. 22/1/2018 The latest Water Rescue Unit was launched today at Oban Community Fire Station. 15/1/20018 15 new recruits for Control Firefighters started today, they will spend 1 week at the Cambuslang National Training Centre then they will go to their respective Controls for 11 weeks before returning to Cambuslang for 1 week then they start on their watch. Each of the 3 Control Centres will get 5 recruits. 29/12/2017 Crew Manager Gordon Brown, Leader of the Kinloch Rannoch Volunteer Unit has been awarded the Queen's Fire Service Medal in the Queen's New Year's Honours List for services rendered over the last 40 years. 15/12/2017 After 14 weeks of intensive training 35 firefighter recruits Passed Out at the National Training Centre in Cambuslang today. 8/12/2017 Chair of the Scottish Fire and Rescue Service (SFRS) Board, Pat Watters retired today after more than five years at the helm. 4/12/2017 Director of People and Organisational Development, Diane Vincent, has today announced her decision to leave SFRS to pursue opportunities outside of the Service. 6/10/2017 Dr Kirsty Darwent has been appointed Chair of the Scottish Fire and Rescue Service (SFRS) Board, taking over from Pat Watters. Dr Darwent has served as deputy chair since 2015, having been on the board since 2012. 28/9/2017 Assistant Chief Officer Robert Scott retired today. 27/9/2017 Local Service Officer for Falkirk and West Lothian, Area Manager Gary Laing retired today. 19/9/2017 New North Operations Control at Dundee was Officially opened today by Minister for Community Safety, Anabelle Ewing. 13/9/2017 The Safe and Well House at SFRS Headquarters in Cambuslang was officially opened today by Annabelle Ewing MSP, Minister for Community Safety. 11/9/2017 Dumfries Water Rescue Unit was launched today. Dumfries Fire Station is now officially the Scottish Fire and Rescue Service’s twentieth water rescue unit. The Unit was transferred to Dumfries from Annan and the other one in the area is at Newton Stewart. 11/9/2017 Today 36 trainee Wholetime Firefighters start their careers with the Scottish Fire and Rescue Service. 17/8/2017 Deputy Assistant Chief Officer Andy Coueslant – Service Delivery North retired today. 24/8/2017 The Western Isles District Office and Stornoway Community Fire Station were officially opened on Thursday, August 24 by Chair of the SFRS Board Pat Watters after a £2.7m refurbishment. 3/8/2017 David McGown who has been Temporary Assistant Chief Officer in the Prevention and Protection Directorate since July 2016 has been appointed Director of Prevention and Protection. 17/6/2017 In the Queen's Birthday Honours list the Queen's Fire Service Medal was awarded to Group Manager Andrew Watt, Asset Management; WM(c) Linda Coughlan, Johnstone Control and Retained Watch Manager Kenneth Simmons, Annan. In the same Honours list Scottish Fire and Rescue Service Chief Officer Alasdair Hay was bestowed a Commander of the Order of the British Empire (CBE). 15/6/2017 The new Deputy Chief Officer Iain Bushell took up his post today. 3/5/2017 National Call Sign appliance callsigns will be introduced to the legacy Lothian and Borders operational area commencing today. 19/4/2017 Four Aerial Ladder Platforms and one Turntable Ladder manufactured by Rosenbauer were unveiled outside the Scottish Parliament today. 14/4/2017 101 recruits passed out at a special ceremony at Cambuslang today after 14 weeks of training at Cambuslang in Glasgow, Portlethen in Aberdeenshire and Thornton in Fife. 28/3/2017 The Scottish Fire and Rescue Service now share 63 facilities with Police Scotland and the Scottish Ambulance Service. A preferred station for a third boat on the River Clyde has been identified and this third station will provide a clear improvement in the water rescue capability. 22/3/2017 Iain Bushell has been appointed as the new Deputy Chief Officer. He is currently Fire Chief and Director of Emergency Management at Strathcona County Emergency Services in Alberta, Canada where he has responsibility for both fire and paramedic response. 8/2/2017 After a distinguished 30 year career protecting the communities of Scotland, Deputy Chief Officer Alex Clark will retire from SFRS on medical grounds on Monday 13 February. 9/1/2017 101 Trainee Firefighters started their new careers at the Cambuslang Training School today where they met Chief Officer Hay. They will be split into three groups which will go to the SFRS National Training College Cambuslang, Thornton in Fife and Portlethan just south of Aberdeen for their fourteen week course. This is the biggest intake of trainees so far. 31/12/2016 In the New Year's Honours List Watch Manager Ian Bell, Response and Resiliance, SFRS HQ Cambuslang was awarded the Queen's Fire Service Medal. 14/12/2016 The new North Service Delivery Area Headquarters in Dyce Fire Station was Officially Opened today by the Minister for Community Safety and Legal Affairs Annabelle Ewing. 6/12/2016 The Command and Control Centre at Seafield Road, Inverness closed today and all calls for the legacy Highlands and Islands Fire and Rescue Service are now being handles at the Temporary Dundee Operations Control at Macalpine Road. The legacy H&I call signs also changed to the new National Call Signs. 17/11/2016 The Dundee Asset Resource Centre was Officially Opened today by Annabelle Ewing, Minister for Community Safety and Legal affairs. This £3.7 million investments brings vehicle workshops, stores, ICT and property under one roof. This is one of four ARCs, Dundee, Inverness, Glasgow and Edinburgh. 8/11/2016 At 10am the legacy Grampian Fire and Rescue Service Control in Aberdeen room migrated to the Dundee Operations Centre and all appliances changed to the new National Call Signs. 4/11/2016 Aberfeldy Safer Communities Hub was launched today by John Swinney MSP. The Police have moved out of their station into accommodation in the Fire Station. 27/10/2016 The Museum of Fire in the old Lauriston Fire Station, Edinburgh closed today and the artefacts will be stored at the antecedent Central Scotland Fire and Rescue Service Headquarters complex at Maddiston, Falkirk until the old AFS station at McDonald Road, Edinburgh has been refurbished. 14/10/2016 The Edinburgh Museum of Fire will be returning to its former home in the McDonald Road Fire Station, Edinburgh where it will be the centrepiece of a new Community Hub anticipated to open in 2018. 13/10/2016 New LSOs were announced today, Area Manager John MacDonald for Highlands, Area Manager Hamish McGhie for Dumfries and Galloway and Area Manager Fraser Burr for Orkney, Shetland and Western Isles. 30/9/2016 The Aberdeen and Dundee workshops closed today. A new facility to replace them both at Highland Chief Way on the outskirts of Dundee and called the Dundee Asset Resource Centre becomes operational on Monday 3rd of October. 28/9/2016 The Dundee Operations Control move into temporary modular buildings at Macalpine Road. 27/9/2016 Chair of the SFRS Board Pat Watters and Chief Officer Alasdair Hay formally opened the new East Service Delivery Headquarters and Asset Resource Centre at Newbridge, Edinburgh today. The new base combines three facilities that had reached the end of their operational life – Lauriston Place in Edinburgh, Maddiston in Falkirk and Thornton in Fife. It brings together 130 staff under one roof and pools the experience and expertise of teams from across Response and Resilience, Prevention and Protection, ICT and Maintenance. 22/9/2016 DACO Paul Connelly retired and DACO Peter Heath moved to become Head of Service delivery for the West SDA. 19/7/2016 Nineteen new control room recruits started at the Cambuslang Training facility before work shadowing at Dundee, Edinburgh and Johnstone Operational Controls for five weeks, after which they will return to Cambuslang for a week’s training before being assigned to their respective watches or groups. 8/7/2016 Cabinet Secretary Michael Matheson was shown the new combined Training Centre for SFRS and HIAL at Stornoway Airport which includes a carbonaceous unit. 24/6/2016 A trial where firefighters respond to help people who have suffered a cardiac arrest has been extended. It involves firefighters being sent to the emergencies to help casualties while ambulance crews make their way to the scene. Falkirk and Livingston community fire and rescue stations are the latest to participate in the trial, which started on the 1st November 2015 and already involves stations at Bathgate, Coldstream, Hawick, Lauder, Linlithgow, Musselburgh and Turriff. 11/6/2016 In the Queen's Birthday Honours List the Queen's Fire Service Medal was awarded to Deputy Assistant Chief Officer Paul Connelly and Watch Manager Bryan Cuthill. 9/6/2016 Sixteen trainee firefighters, thirteen men and three women, have graduated at the Portlethen training centre near Aberdeen. They will be posted to stations across Aberdeen. Firefighter Natalie Parslow won the Chief Officer's prize for best trainee. 7/6/2016 Rosenbauer have been awarded a three year contract to supply Aerial Ladder Platforms throughout Scotland, with the first four units to be built and delivered within 2016. A further six units are anticipated to be built and supplied by the end of 2019. The Aerial Ladder Platforms will be the Rosenbauer B32 built on 26 tonne Volvo chassis, incorporating the world-class 500 kg rescue cage and the latest ‘design bodywork’ package with the now standard Anthracite boom/rollershutter package. 22/4/2016 Thirty new recruits had their Passing Out Parade at the SFRS National Training College in Cambuslang. They displayed the life saving skills they have learned in the last fourteen weeks. They will now be posted to nineteen stations throughout Scotland. 30/3/2016 At 10am the Operations Control at Thornton moved to the refurbished Operations Control in Edinburgh. All calls in The East Service Delivery Area are now handled by the Edinburgh OC and all East SDA stations are now using the new National Call Signs. 7/3/2016 Sixteen new recruits started their fourteen week training course at the SFRS Training Centre at Portlethen near Aberdeen. The trainees are the fourth group to undertake the foundation firefighter course since the SFRS was formed in 2013. All the recruits will be deployed to the North SDA with the majority going to Aberdeen City. 1/2/2016 The site of SFRS College – National Training Centre, Cambuslang will be the location of the new national headquarters and all corporate business will be run from this site from Monday 1 February. 26/1/2016 Appliances and stations in the legacy Maddieston Control area will move to their new National Call Signs with the amalgamation of Maddieson and Edinburgh Controls. Legacy Edinburgh Control area will still use existing call signs. 18/1/2016 30 new entrants started their fourteen week recruits course today at the Scottish Fire and Rescue Service National Training Centre at Cambuslang. 14/1/2016 This month will see a number of retirals from the Service namely ACO Dave Boyle, ACO Dave Goodhew and ACO Peter Murray. 8/1/2016 For what I believe is the second time the Flood and Environment Rescue Unit from Renfrew has been deployed to an incident (the first being flooding in Bearsden due to a burst water main 8/7/2013), the FERU was sent to the Tayside and Aberdeenshire areas for protracted use of its equipment during the recent flooding. 21/12/2015 Aerial Rescue Pumps in the legacy Strathclyde area had the crew reduced from six to five to bring them in line with the other legacy areas. 9/12/2015 The refurbished Control Room in Edinburgh was officially opened by Minister for Community Safety and Public Affairs, Paul Wheelhouse. This state-of-the-art facility will manage control room operations in the East of Scotland. 19/11/2015 The Chief Officer announced a number of members of the Strategic Leadership Team will be retiring in 2016 and as a result there will be a number of changes with the SLT structure. Scottish Fire and Rescue Service are advertising for a Director of Strategic Planning, Performance and Communication (Rank of Assistant Chief Office) at a Salary of £101,508. Minister for Community Safety and Legal Affairs, Paul Wheelhouse, has agreed with the Service’s recommendation that the site of SFRS College – National Training Centre at Cambuslang will be the location of our new National Headquarters. 1/11/2015 National out-of-hospital cardiac arrest co-responding trial starts in the East SDA where by Ambulance Control will dispatch a trained and equipped fire crew (if they are nearer) at the same time as an Ambulance. 29/10/2015 The Scottish Fire and Rescue Service is currently refurbishing the Control room in Tollcross, Edinburgh which will ultimately manage Operational Control room operations within the East of Scotland. This will cover the legacy areas of Lothian and Borders, Fife and Central Scotland. Work is on-going to prepare for the migration of the legacy Maddiston and Thornton Control rooms into the refurbished Tollcross Control room. On 23 November, the Scottish Fire and Rescue Service will take another step towards this migration with the opening of the East Service Delivery Area (SDA) Operational Control in Tollcross. This is the start of a phased process which begins with Tollcross staff moving back into the refurbished Control room, closely followed by the merger of Maddiston and Tollcross on 26 January 2016. Thornton Operational Control is also part of this migration process and will migrate with Tollcross during the 1st Quarter of 2016. 8/10/2015 SFRS has joined forces with the British Heart Foundation to help save lives across the country by providing fire stations as a base for members of the public to teach themselves CPR. The Service has agreed to house CPR kits and DVD training videos at its 356 stations across Scotland, and members of the public can contact their local community fire station to arrange a time to go into the station and watch the DVD which will give them the information they need to become a life saver. There will be manikins available at each station which visitors will use along with the instructional DVD. This partnership is one part of our commitment to support the Scottish Government’s Out of Hospital Cardiac Arrest Strategy, which aims to save an extra 1000 lives in Scotland by 2020. The partnership launches on European Restart a Heart Day (Friday 16 October 2015). This is an annual event organized by the European Resuscitation Council (ERC). It is designed to raise cardiac arrest awareness by teaching members of the public how to restart a heart after a cardiac arrest. The initiative aims to pass on lifesaving skills to as many people as possible. Today there was a Board meeting; previously the Board had submitted to the Scottish Government for ministerial approval a request that we locate our headquarters in Stirling. We had followed all the guidance and criteria that the Scottish Government had set out for us but of course we live in a time where the spending of public money is getting ever and ever tighter, so we had feedback from the Scottish Government that it would be inappropriate to do that. They gave us a change in the criteria that they set which enabled us to look at other premises in Scotland within our current portfolio and the Board decided this morning that subject to ministerial approval, the headquarters of the Scottish Fire and Rescue Service will also be located here at this Clydesmill facility which is in Cambuslang in South Lanarkshire. So I will be, if the Minister approves it, located here, which is also our new college. 29/7/2015 Today the Clydesmill Training Centre was officially opened by a flag raising ceremony as the new Scottish Fire and Rescue Service College, where it has taken on all the functions that were previously undertaken by Gullane. 12/6/2015 The Queen's Fire Service Medal was awarded to Firefighter Stephen Bates (worked predominantly in the north of Glasgow), Watch Manager Roddy Lees (Banchory Station in Aberdeenshire) and Assistant Chief Officer Robert Scott. 26/3/2015 A report to the Board by DCO Alex Clark concluded that the site at Kildean Business Park, Stirling is the preferred option for the SFRS Headquarters building and this was the recommendation. 11/2/2015 The first white appliance on Shetland is now on the run at Sandwick. R337RSA is a former Grampian Fire and Rescue Service white Scania which was first stationed at North Anderson Drive. 29/1/2015 The Board approved the final report in regards to the Review of Specialist Resources and agreed that a programme of implementation be developed and communicated in conjunction with the Service Transformation Committee, with the caveat that SFRS will continue to engage with all Local Authorities during this period of change. 5/1/2015 ACO Peter Murray has been appointed as Director of Service Transformation; ACO Dave Boyle as Director of Service Delivery; and ACO Robert Scott as Director of Strategic Planning, Performance and Communications. The new Deputy Assistant Chief Officers (DACOs) took up post on 5 January 2015 with Paul Connelly, Andy Coueslant and John Miller in place as Heads of Service Delivery for the West, North and East respectively. David McGown has been appointed as DACO for Prevention and Protection and Peter Heath has been appointed as DACO for Response and Resilience, however, he has been seconded to HR as Head of Human Resources and Organisational Development, with current management structures in R&R remaining in place for the time being. One remaining DACO, Training and Development, post has still to be filled. Congratulations to Andy Hermiston who was offered the DACO role in Training and Employee Development but who has since been successful in securing the Deputy Chief Fire Officer post at Gloucestershire Fire and Rescue Service. The SFRS DACO post will be filled shortly. 31/12/2014 In the Queens Birthday Honours List 2015 the Queen's Fire Service Medal was awarded to Assistant Chief Officer David Goodhew and Crew Manager William Paterson (Balintore Community Response Unit). 3/12/2014 The successful candidates for the six Deputy Assistant Chief Officer's posts were announced today as Paul Connelly (West SDA), Andy Coueslant (North SDA), Peter Heath, Andy Hermiston, David McGown, John Miller (East SDA). They will take up their posts early in the New Year. The other three DACO posts will be People and Organisation Development (old HR), Prevention and Protection (old Fire Safety), and Training. 17/11/2014 The Control Room at Dumfries today merged with the Control Room at Johnstone with all calls for the West Service Delivery Area being answered at Johnstone. 7/5/2014 On the 7th May 2014 public recruitment of Firefighters will start through the www.myjobscotland.gov.uk WEB site. 28/4/2014 A tender has been issued to supply Self Contained Breathing Apparatus to the Scottish Fire and Rescue Service. It is envisaged that the contract will be for between 2,000 to 3,000 SCBAs and the initial contract will be for an initial period of 9 years with the possibility of being extended to 12 years maximum. 22/4/2014 At 9-30am today the first red appliances since 1998 in the former Grampian FRS area went on the run at North Anderson Drive, Aberdeen. Since 1998 appliances in this area have been white. 17/4/2014 The workshops at Maddieston (former Central Scotland Fire and Rescue Service) officially closed today. 11/2/2014 Area Manager Stewart Edgar (former Interim Chief Fire Officer Highlands and Islands Fire and Rescue Service) has been appointed Chief Fire Officer of Gloucestershire Fire and Rescue Service and will take up the post on the 24th of February 2014. 1/1/2014 In the New Years Honours List the Queen's Fire Service Medal was awarded to Watch Manager David Farries, Fire Investigation Unit based at Livingston Fire station and retired Watch Manager (Thomas) Kevin Blair, Officer in Charge at Dunbar Retained Fire station. 3/9/2013 The Union flag is flying at half mast at stations with flag poles as a mark of respect for Stephen Hunt whose funeral is taking place today at 11am in Bury Parish Church. Stephen died in a fire in Manchester on the 13th July, 2013. 29/6/2013 Group Manager Paul Stewart has been promoted to Area Manager in charge of Fire Safety at the Glasgow Commonwealth Games 2014. 17/6/2013 A dedicated Police Office has been provided in Newcastleton Fire Station. The Police Station in Newcastleton was closed in 2012. 15/6/2013 In the Queen's Birthday Honours list issued today the Queen's Fire Service Medal was awarded to Area Manager Stewart Edgar who was the Interim Chief Fire Officer of Highlands and Islands Fire and Rescue Service until the 31st March 2013; Retained Watch Manager Anthony (Tony) Linney St Andrews Fire Station; and Crew Manager Paul Souden Campbeltown Community Fire Station. ?/?/2013 The term 'Hub' has been changed to Service Delivery Area (SDA). 1/4/2013 Cowcaddens Workshops take on the maintenance, servicing etc of all legacy Dumfries and Galloway Fire and Rescue Service vehicles, plant and equipment. 29/3/2013 The Launch of the Scottish Fire and Rescue Service took place today at the Training Centre, Perth Community Fire Station and at the North Inch, Perth. 14/1/2013 The first formal meeting of the Board took place today at 11am in the Council Chambers of Perth and Kinross Council Buildings in Perth. 10/1/2013 The Interim Headquarters moved out of Perth Fire Station last year to the upper floor of Perth and Kinross Council building at number 5 Whitefriars Crescent, they have since moved back to Perth Fire Station to allow the top floor to be painted and will be moving back to Whitefriars in February. 30/11/2012 Chief Officer Hay announced the final two members of the Strategic Leadership Team which will officially take up office in the new year. The new Director of People and Organisational Development was confirmed as Diane Vincent, Head of Organisational Development at Strathclyde Fire & Rescue. The Service's new Director of Finance and Contractual Services was named as Sarah O'Donnell, Head of Finance at Strathclyde Fire & Rescue. 2/11/2012 Six Senior Officer appointments announced today. 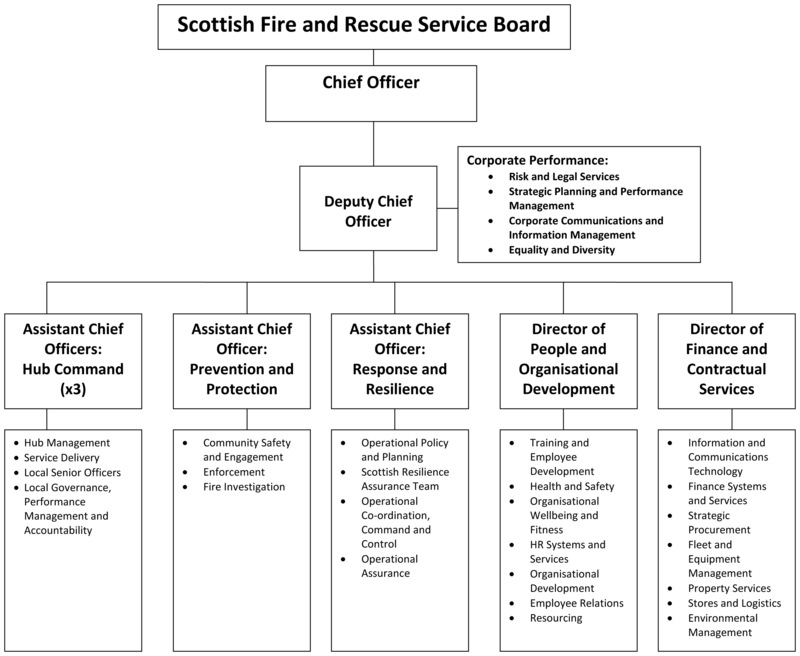 17/10/2012 Members of the Board of the Scottish Fire and Rescue Service were announced today. 31/8/2012 Pat Watters is appointed as the first Chair of the new Scottish Fire and Rescue Service. The appointment will be for three years from September 2012 and will attract a remuneration of £430 a day for a time commitment of between 15 to 20 days per month until April 1, 2013. For the first full year, the time commitment is expected to be at least 10 days per month but no more than 15. 16/8/2012 Alasdair Hay is appointed as the first Chief Officer of the new single Scottish Fire and Rescue Service at a salary of £165,000. 21/2/2012 Perth Community Fire Station is announced as the interim headquarters of the new Scottish Fire and Rescue Service. I’d like to thank everyone who has come along today to help us mark the inception of a new, national, Scottish Fire and Rescue Service (SFRS). Since we began planning in earnest just over a year ago for this transition from eight regional fire and rescue services into a single Service we have had a firm focus on the work that needed to be done but also our eyes on the horizon and the date of 1 April 2013. It’s amazing because it has taken on a significance of its own and become a focal point for staff in particular but also for all those who we work with at national and local government, partners and key stakeholders and, perhaps to a lesser degree, the public. But it is a date that marks the end of one process and the beginning of a new organisation, a move we expect will be a seamless transition that will largely go unnoticed for the majority of people out with our respective fire and rescue services. I firmly believe that this reform process will enable us to protect frontline services and ensure those resources are available 24/7, 365 days a year to ensure the safety of the public. Our staff remain firmly committed to that objective because what is critical for all of us is the delivery of a safe and effective fire and rescue service for the people of Scotland. Our personnel have been working exceptionally hard over the past year to ensure that working in partnership we will deliver a handover that provides business continuity and the ability to develop the Service as we move forward. Our SFRS Board Chair Pat Watters and the Board members are also absolutely committed to that process and they have been supporting us and scrutinising our strategic planning as we make this move towards a national Service. I do recognise that the reorganisation of our services is one -of the most significant changes for the fire and rescue service in a generation. But we have a senior management team structure in place, Directors of Service Delivery for the North, West and East, 17 local senior officers to serve the 32 local authority areas and retain that key local connection and week by week we continue the transfer and matching process that will allow us to build new teams, with a wealth of experience, who will support the implementation of the detailed plans designed to achieve our objectives for a positive transition. What has struck me most during my visits to different Service areas in the last few months is how dedicated and positive our staff are. They want to ensure that the best traditions of our Service remain and that we take every opportunity to maximise best practice, wherever we find it, to build stronger services for safer communities. As we come ever closer to 1 April there is a palpable sense of readiness, we are set to make this change and have the collective desire to use this opportunity to build a Scottish Fire and Rescue Service that we can all be proud of and which delivers excellent and equitable services across the country. We all have a part to play in making sure that this process is a positive one. We have had fantastic support from our local authority areas across Scotland, key partners and very positive engagement with a wide range of stakeholders and I believe people understand what we are trying to achieve. There is still a significant amount of work to do though and the new Service will take time to evolve but the commitment is there both internally and externally to deliver and to ensure that our local communities benefit from this new national service. We need to continue building on the excellent work that has already been done by the existing services. I hope you will enjoy today, please do take the opportunity to speak to some of the local officers, firefighters and support staff you will meet. They will be delighted to tell you about the work that is being done both in terms of preventative community safety initiatives and on the response side of the organisation. You will also enjoy seeing some of the equipment and specialist skills we have at our disposal to respond in emergencies and help us keep people safe. Once again thank you for your attendance here today and I will look forward to meeting with you in a new Scottish Fire and Rescue Service. I am looking forward to seeing everyone today as we gather to mark the beginning of a new, national Scottish Fire and Rescue Service for the people of Scotland. As the Chair of the Scottish Fire and Rescue Service Board I can say that myself and the Board members have been working very closely with the Chief Officer and his team to develop the detailed plans in place to make this transition. Staff in the fire and rescue services have been working very hard to bring these plans to fruition and I know that people are excited about the opportunities this will afford us to improve on the vital services we deliver to local people. The Board will play a crucial role in scrutinising the performance of the new Service as well as supporting the Chief Officer to shape and direct a Scottish Fire and Rescue Service that delivers for communities across Scotland. Partnership will be at the heart of everything we do. We will work closely with national and local government and develop stronger relationships with key partners including police, social care, health and housing and of course, staff, their representatives and the public to deliver a service we can all be proud of. Services will still be delivered from local stations by local firefighters and there should be no change to the excellent level of fire and rescue service provision and indeed we will be challenging the SFRS to improve where it can. A national service will ensure that people across the country have access to services that are designed on the basis of local need with the support of national expertise and resources.